Last year, PD interviewed Paul Kruger, who was looking to make the change to NFL linebacker. 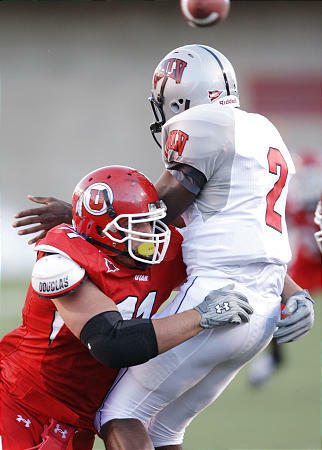 This year, we talked with Koa Misi, another Utah defensive end seeking the same change and similar success (Kruger was drafted in the second round by the Baltimore Ravens). Initial questions of how Misi would take to these challenges were answered during Senior Bowl week, when he weighed in 19 pounds lighter than this past season. We caught up with the Californian on an unusual day for him: one that involved a rest from training. Today seems like a little break for you. What are you up to today? Just over here at Disneyland with my fiancée. Taking a little break before I go out to Indy (for the combine). When do you plan to head out to Indy? I head out on the 26th or 25th. Okay. Do you think your experience with Senior Bowl week has prepared you for that? Oh, yeah. Just training and stuff, for sure. Where I’m training, at API (Athletes’ Performance Institute) in L.A., I just feel like they’ve done a great job getting us prepared and letting us know what we’re going to see over there, so I think it’s really helped out a lot. I noticed that your weight at the Senior Bowl was 19 or 20 pounds less than what it was listed during the season. Was that something that you started right after the season, or did you lose weight gradually in the fall? During the season I started losing weight, and then after the season I just kept losing weight. I figured, Ken (Zuckerman), my agent, told me I was going to be playing a different position and I needed to get my weight down, so I did. So you’ve been told – and I’m sure a lot of people have been asking you – about the switch from defensive lineman to an outside linebacker. How do you feel about that? I feel good. I love playing linebacker – I actually played linebacker in high school – and it felt good playing linebacker in the Senior Bowl. I just felt like it came naturally to me, and I can’t wait. What are some of the biggest adjustments that you have to make, making that position change? I don’t know. I don’t really feel like I have to change anything. I played a little bit in college, but like I said, I felt natural playing linebacker. I just feel like it comes pretty easy to me. Last year I got the chance to talk to Paul Kruger. He played your position in college, and he had to make the adjustment. Have you watched him at all, and has it been helpful to see what he’s gone through? Actually, I’ve only watched maybe a couple of games of his and I’ve only seen him in a couple of times, but I guess so. Just watching anybody making that transition helps out, just so you know what to expect when you step up to the next level. Yeah, I guess you could say that I was, a little bit. I was watching other people. Do you feel faster now, having lost the weight? Yeah, actually, I do. I just feel like I can move around a lot easier, and then there’s the added speed also, with the weight loss. I feel a lot healthier at a lighter weight, and I think it will help me out when I play. What do you mean you feel healthier? Oh, I just feel like my body moves a lot better. Just the way I’m eating now, I’m eating a lot different than I used to, healthy-wise. I don’t know, just movement and my body recovering faster, just how I feel when I work out and run. I guess that’s how I’d explain that. When you were in college, were you eating to try to keep on weight to keep your defensive line position? Is that one of the bigger changes? What are some of the dietary changes you’ve made? (Laughs.) In college, I didn’t really have a diet. I just ate whatever I wanted, went out to fast food restaurants. And now, I’m on a special diet where they’ve been measuring out my food, how many calories I’m eating, how many carbs I’m eating. I don’t even make my food, they make my food for me and all I do is stick it in the microwave. I feel like it’s helped me a lot, because in college I never ate this way, and I can see a difference now. And you’re maintaining your weight? You’re at around 245? Yup. I’ve kept the same weight since I’ve been here, just eating differently and working out every day. It feels great. I read somewhere that you have a great weight room ethic. What’s the most weight you’ve put up in the squat? Oh, I don’t know… I think 565 (pounds) or more, up there somewhere. I’m not sure. So, at what point – when you have that much weight on your back – do you think, wow, this is a really terrible idea? (Laughs.) I don’t know, I’ve always loved to squat. Back in high school, my dad kept me to my weight lifting, just being there and pushing me through the squat. I don’t know, I haven’t really ever thought that. I guess you could say that’s one of my things that I like to do when I’m in the weight room. Do you think that transfers well, in terms of your 40 and vertical jump and some of the other drills you’re going to have at the combine? Oh, yeah. Just making (your) legs stronger, I think, helps with your explosion and the way you’re pushing off. I think it helps out a lot. What’s the most difficult exercise or drill that you’ve been doing the last few weeks? I don’t know if there’s any difficult drill… Mostly, the stuff that we do is all technique and body movement. Just the way you move is what they’re concentrating on over here. The workout we have here that’s called a metabolic workout, you’re just burning out when you’re lifting weights. I guess you can say that would probably be the hardest thing here, but even that feels good after you’re done. You’re muscles are all pumped up, and you just feel good. Have you been tested in anything while you’ve been there? We tested a week ago maybe, but they haven’t given us our numbers back. How did you feel about it? How do you think you did? I felt good. Everything I’ve done out here, I’ve felt good about. I think I’m pretty prepared coming into the combine. Have any NFL scouts spoken to you? Not since the Senior Bowl, no. Who spoke to you there? Oh, pretty much everybody. I know it was every coach I saw (who was) there. Did you get a chance to talk to them much? Yeah, I think so. I don’t really remember – there were a lot of meetings. Well, Koa, just to wrap up, do me a favor and say your full name so I can write it out phonetically for our readers. All right. It’s Nawa’akoa Lisiate Foti Analeseanoa Misi (Na-VAH-ah-KOH-ah Lees-YAH-tay FOH-tee AH-nah-LEE-see-ah-NO-ah MEE-see). Koa, thanks a lot for speaking with us today. Misi was drafted by the Miami Dolphins in the second round (40th overall).